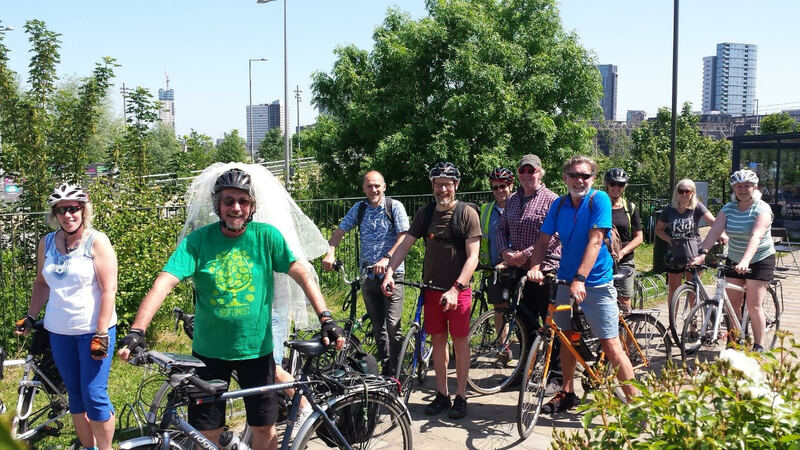 11 of us set of from view tube on a gloriously sunny day forgoing the royal wedding for a tour of east end breweries – with only the ride leader dressing for the occasion (thanks Anita for loan of bridal headgear!) 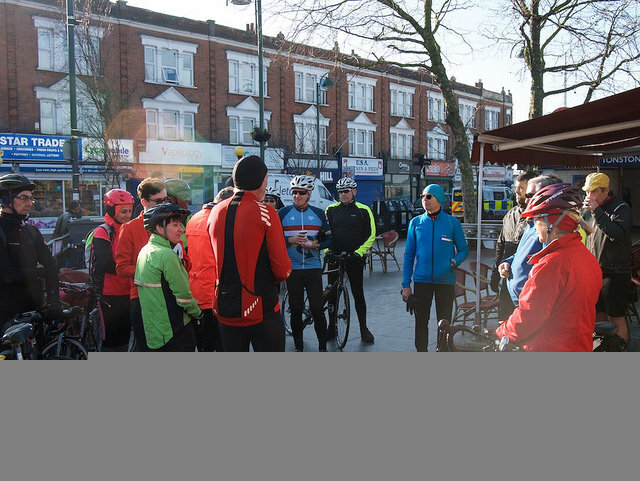 We past Mason & co (tap room for Five points brewery) and looked down on Westfield (home of tap east brewery) before meeting up with two other riders at Pretty Decent brewery in Forest gate (& a quick refreshment stop!) 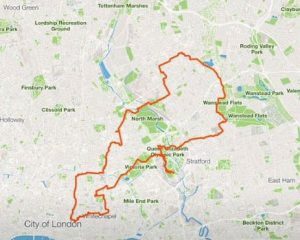 we then skirted Wanstead flats to travel north to Wild card & Pillars breweries for a lunch stop (taking in the amazing ‘gods own junkyard’ and ‘the big al’ beer & cider shop on same estate) we then headed east taking in a few breweries before stopping for a thirst quencher at London Fields brewery tap room. With only one slight off road tumble (not beer related!) and one puncture -unfortunately as in rear wheel of a brompton the rider left us at that point -mechanically the ride otherwise went well! After the inclement weather of the previous day, it was great to see 15 ladies gather at the View Tube (8 of us having ridden together from Forest Gate at the WI ‘collection point’). 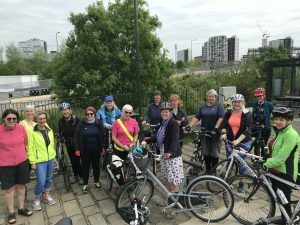 Our glamorous ride leader Anita briefed us on the route before we set out along the Greenway & down the Lee Navigation, leaving at Bow to cross the A12 via the underpass and head into the streets of Poplar. 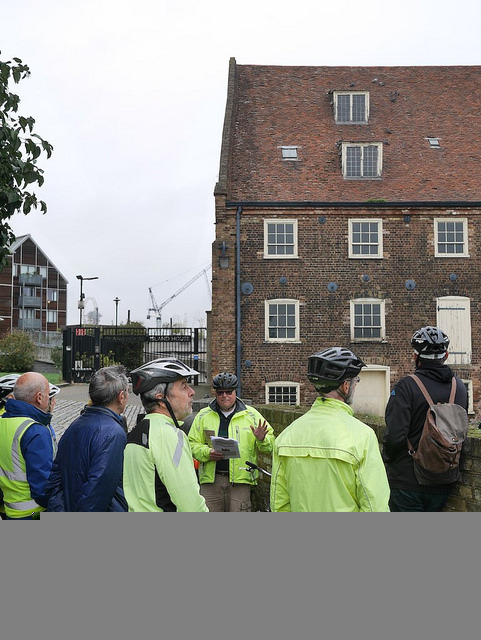 Of course, it also featured a tea stop by the Museum of Docklands and a lunch stop on Pepper Street! Like all good tour guides, Anita saved the gem of the tour until last. The real ‘Nonnatus House’ – actually St Frideswide Mission House on Lodore Street (sadly now flats), where we could peer down a gated alley to see where the midwives bicycles would have been stored! 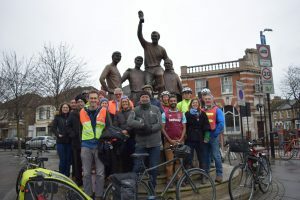 Our crack team of marshals was out in force to guide 70 riders (including a large contingent of children and their parents from Central Park School) from the Boleyn Statue to the London Stadium and back. Some used dockless bikes provided by Mobikes. 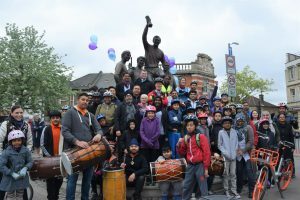 Stephen Timms MP was amongst the riders as well as local councillors. 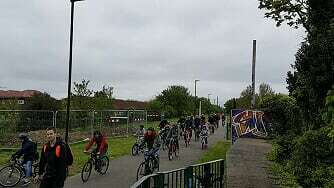 Most children also enjoyed a session of football training from the West Ham Foundation at the Community Track. Unsolicited feedback was extremely positive. 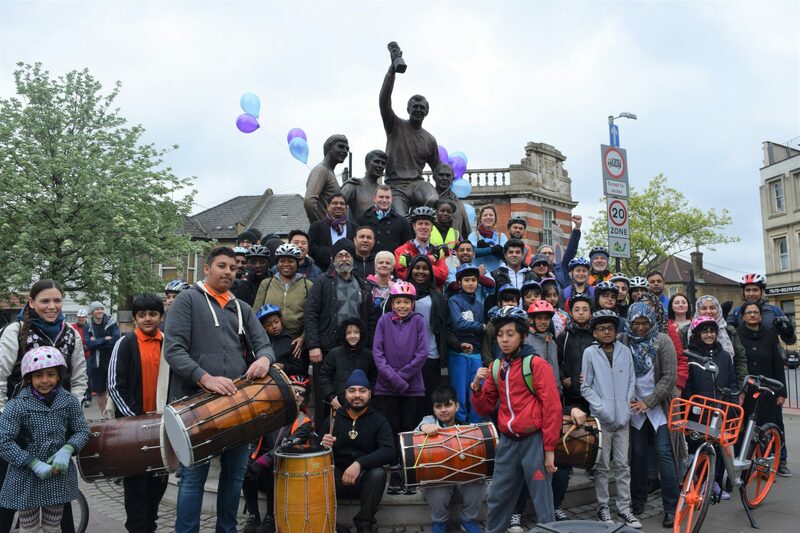 A very successful event in partnership with the Bike from Boleyn organisation which demonstrated the value of the Greenway for getting around Newham. Thanks also to Newham Council for providing a Dr Bike, facilitating the dockless bikes, and opening the big gates on the Greenway. Despite having to pull the ride day forward as we were clashing with the marathon we had another good turn out at the View tube on Saturday -with riders from Newham, south London, Elm park and as far afield as Brentwood! 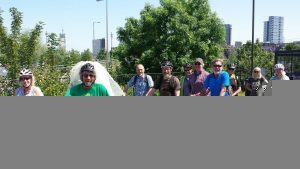 20 of us set off on a very sunny day down the river Lee calling at Three mills & Cody dock. 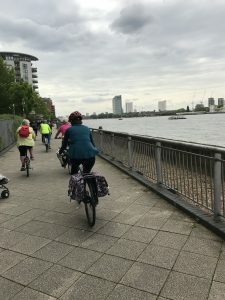 For a change, after Bow ecology park, we crossed the bridge to London city island and navigated through the new open areas. 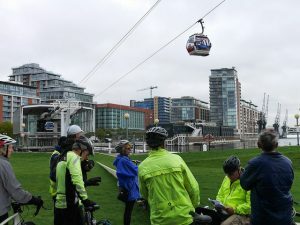 After a quick visit to East India Dock we followed river through isle of dogs to Greenwich via the foot tunnel -here we picked up another south London cyclist then navigated the extensive diversions to the Thames path stopping for lunch at the cafe under cable cars -here we lost half the group to a local pub, football or gardening! 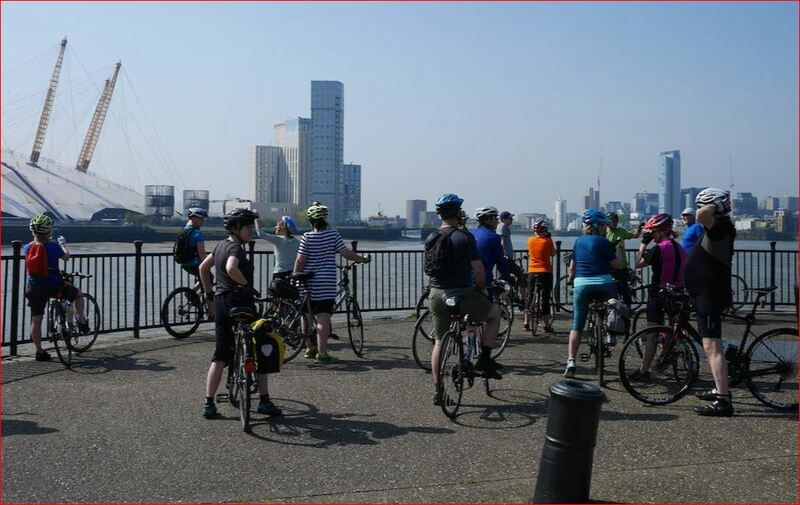 However the rest of us continued along Thames path to Woolwich ferry -some exploring an interesting local Tor viewpoint & the site of the wreck of the Princess Alice boat on the Thames -with the loss of many lives in 1878. 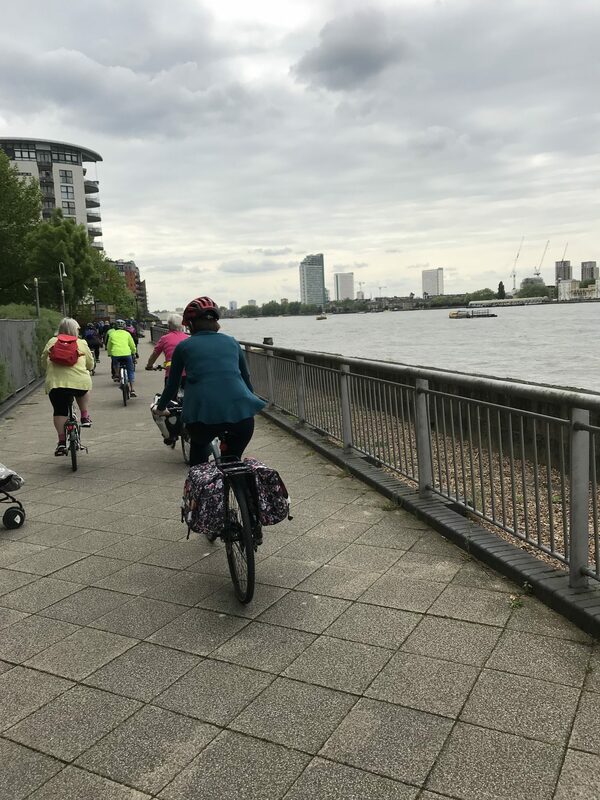 We then picked up greenway & followed it back entering Olympic park via new ramp leading to Channelsea passage – ending with a welcome beverage at the view tube cafe! 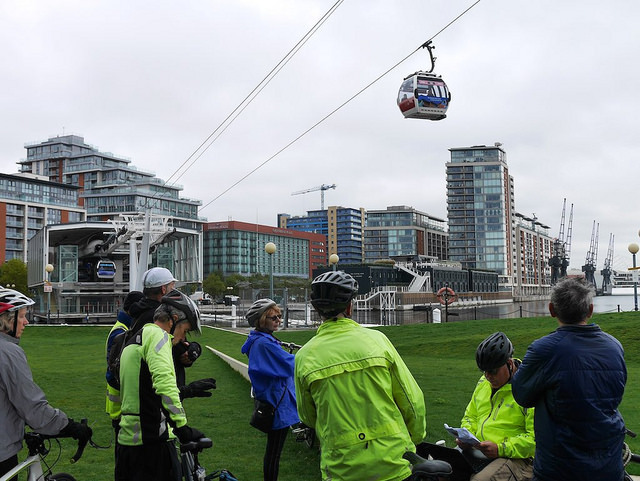 We welcomed no mechanical problems this time and that no-one fell in the river! 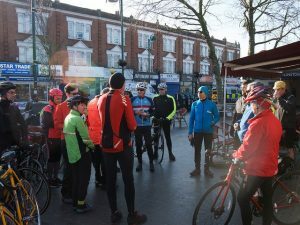 Given that the clocks had gone forward to BST and everyone had an hour less sleep we had an excellent turnout for this ride. 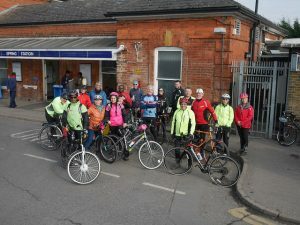 Eighteen of us gathered at Leytonstone to catch the tube to Epping where three more riders awaited our arrival. 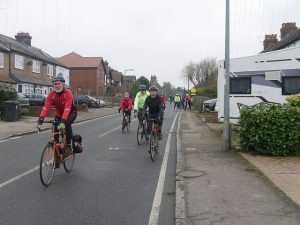 The weather was clement, 10C and no wind, which was helpful as we were a large group on a slightly longer ride than usual, 37miles riding clockwise around Harlow. 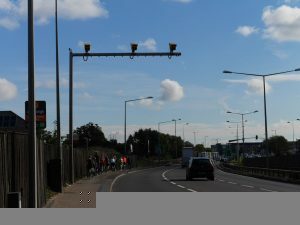 The road from Epping to Roydon in Hertfordshire is quite fast, and there was a fair amount of Sunday traffic so it was nice to cross the level crossing at Roydon and enjoy the quiet roads to Hunston and Much Hadam. There we crossed the ford and rode up towards Perry Green and the Henry More foundation, this is where the technical problems started. 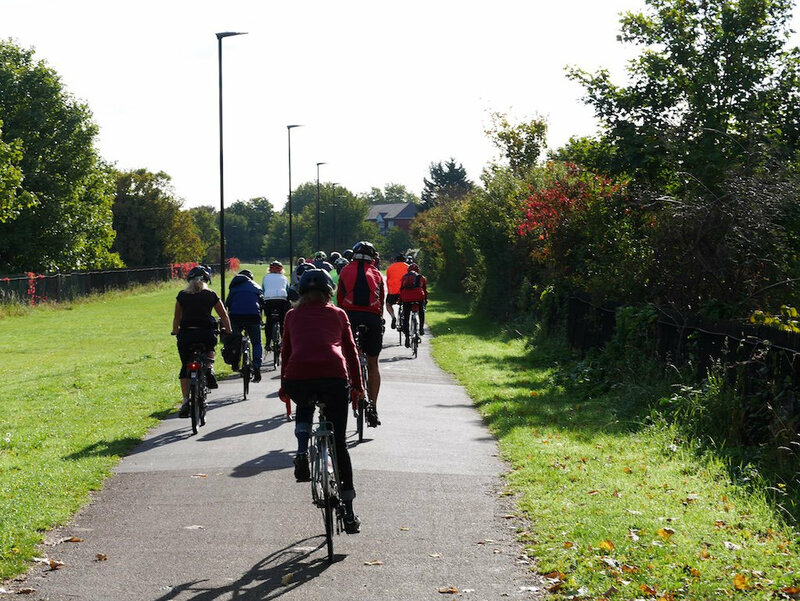 Arnold’s derailleur sheered off just outside Perry Green. 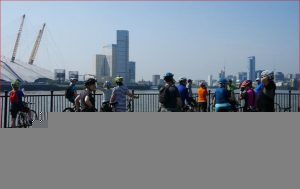 A few of us stayed to help, while the majority rode on for a mile to see the HM foundation and get a coffee. We broke the chain, disconnected and removed the derailleur and shortened the chain, so it became a single speed machine. About to move on and I discover I had a flat, the first of two for me and these deflations were followed by those of two other riders, four punctures in all. The cafe at the HM Foundation was closed and so we continued with a caffeine deficit. 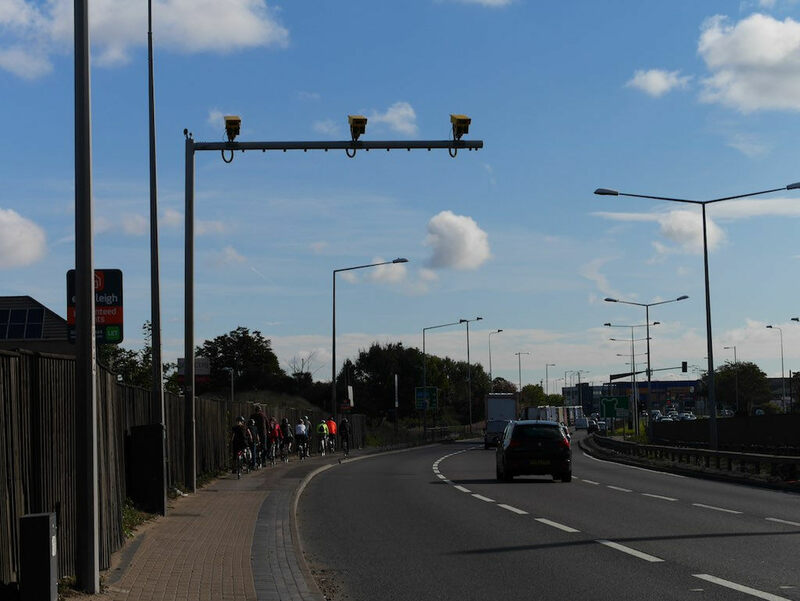 We crossed the M11 and arrived at Sawbridgeworth, where Arnold’s single speed repair finally failed and he took a train home. We followed the Essex lanes to Matching Tye where we had a well deserved lunch at the Fox, the food was good and it was warm enough to eat in the garden for those that chose to. The route back followed Fagotters Lane towards Blake Hall and Toot Hill. We fixed another complicated flat, where the valve broke in the pump, and tackled the final hill to Epping Station in the sun. 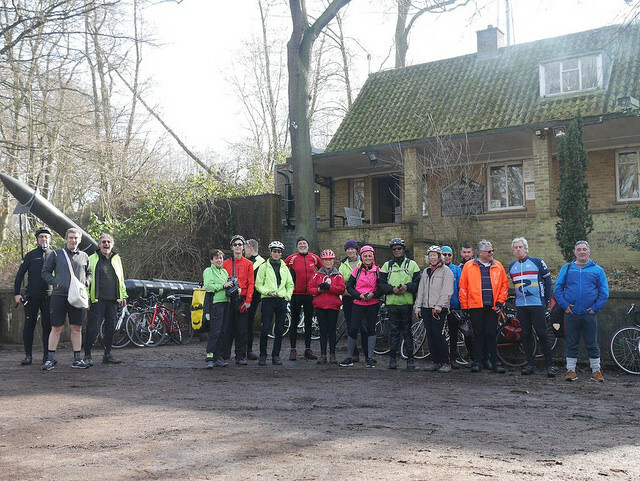 Overall an eventful ride, but very satisfying that we overcame our problems and enjoyed the day’s riding in the spring countryside in good company. 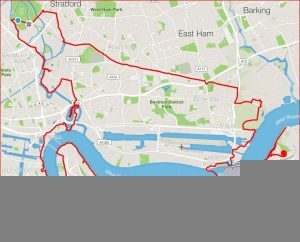 Throughout the cold spell the dream of the “Come on You Irons” West Ham United themed ride did not fade and die and we were rewarded by starting off the ride in the usual Newham Cyclists balmy weather conditions. 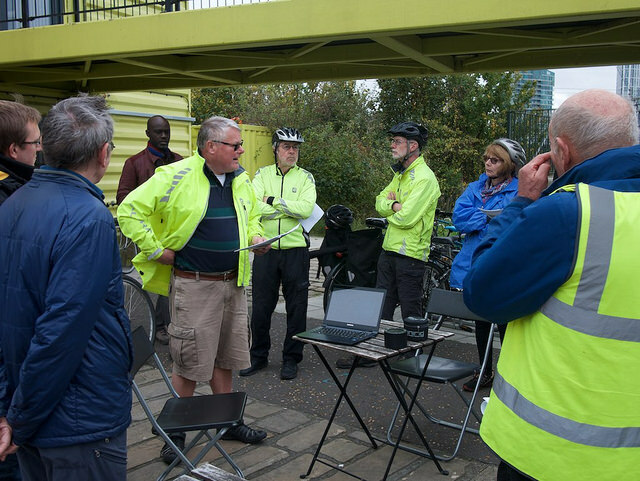 Things did take a turn for the worse with thicker cloud cover and being too early for the coffee stall at Cody Dock. 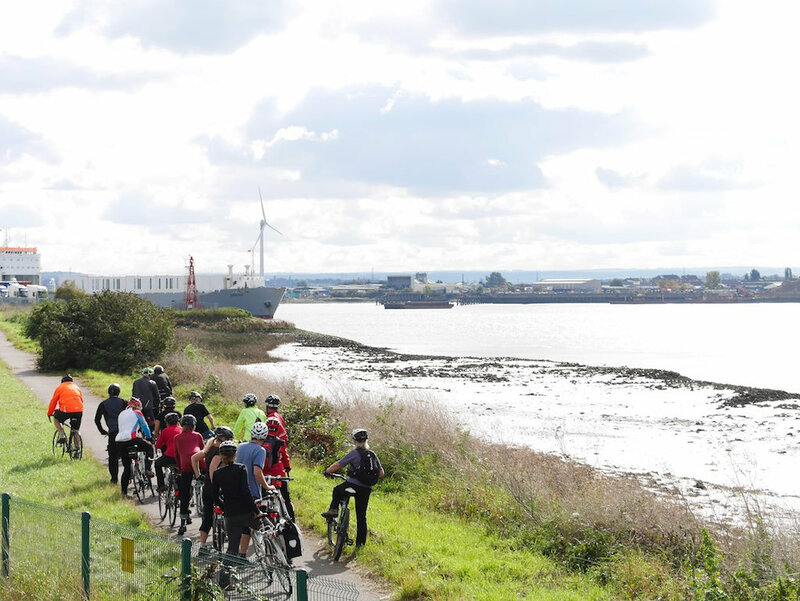 Undeterred the band of 11 continued through quiet back streets and off road routes to visit 4 of the five sites where West Ham play(ed) and the site of the Thames Ironworks. Here was a welcoming party from our partners in Bike from Boleyn, including Bobby Seagull. On Saturday 17 February 6 Newham Cyclists set up their stall to check and fix bikes at the children’s bike club of Ambition, Aspire, Achieve at the Terence Brown Arc Canning Town. 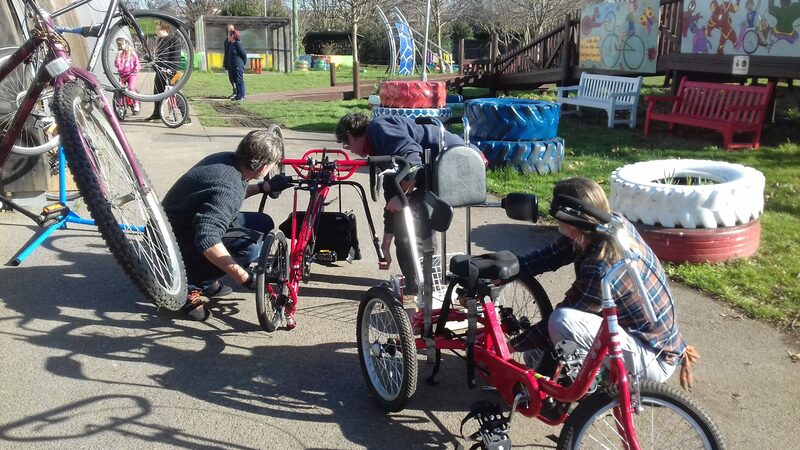 We were blessed with unseasonably sunny and warm weather as bikes were checked for future use by the club, including a ride we are proposing to lead on 24 February based on the Greenway. 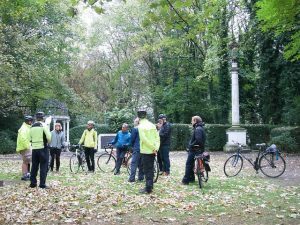 Maybe it was the fine weather, maybe some cyclists felt impelled to know the whereabouts of a place of greater safety, the reason is unclear, but the outcome was that we had a record 21 riders for this second ride of 2018. 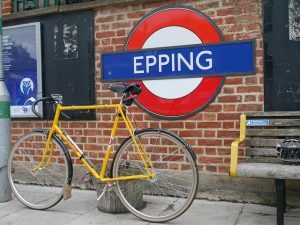 The central line staff and passengers were bemused by the large number of cyclists boarding the train at Leytonstone for the journey Epping and the start of our adventure. From Epping station the route took us on a long downhill out of the town, under the M11 and into the countryside. 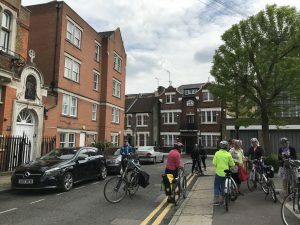 There had been some debate about whether the route is undulating or hilly, so this time we had among us one rider on a single speed fixy who would put it to the ultimate test. 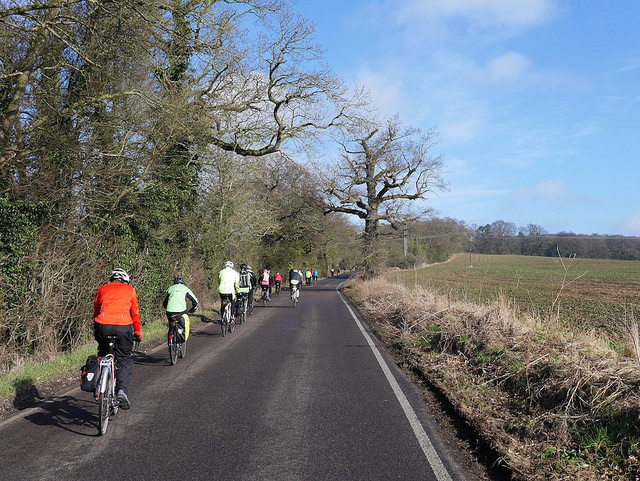 The ride up to Toot Hill is a good way to warm up, then we followed the small lanes to the London Road. We crossed over and followed Shonks Mill Lane down to the ford, often flooded in winter, but although the water in the stream was high the road was dry. We turned off up Lady Hill and this eventually brought us to the back of the SNB. Ignoring the “Keep Out”, signs we crossed no mans land and found ourselves outside the SNB and next to the familiar bombs/rockets. Some riders even locked their bikes to these for extra security during the visit. Our first ride of the new year was blessed with mild weather and a good turnout. 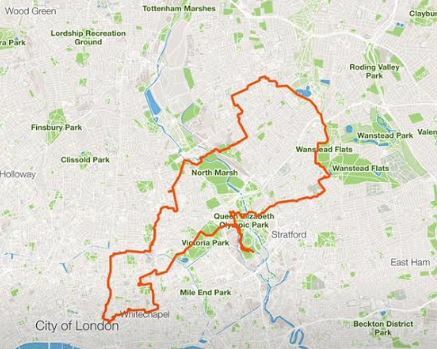 We took the Central Line from Leytonstone to Epping, where the ride began with a nice downhilll run. 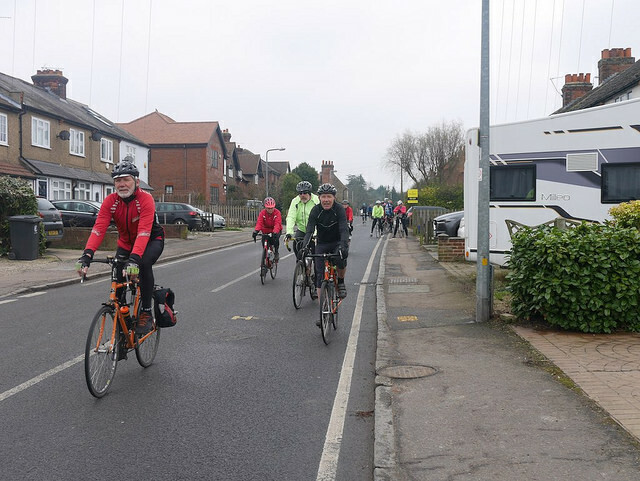 We saw a good number of cyclists around Toot Hill which is popular for its undulating terrain. We arrived at the church a little after 11am but there were no other visitors, despite it being Sunday. This allowed us to take a good look around, we saw the painting of St Edmund, after whom, it is thought, the church was founded. This oldest wooden stave church has a crusaders grave, leper hole and links to the Tollpuddle martyrs. With a history of over 1000 years there are lots of stories about the church and its congregation, some of which may even be true. 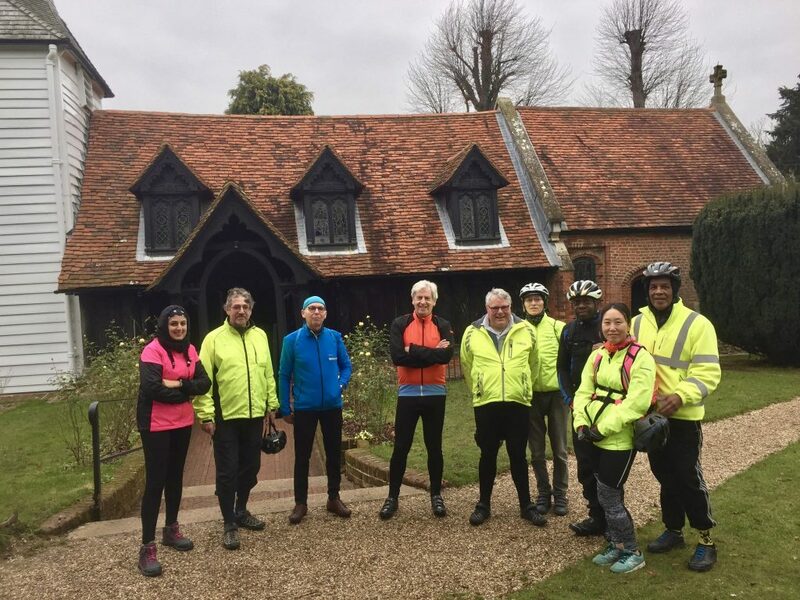 We continued to Ongar and took the old roman road, unfortunately this is rather popular with speeding motorists, so we were pleased to turn into Berwick Lane and wind our way through the empty country lanes back to Toot Hill. We stopped at the Moletrap pub for lunch. It is a lovely, characterful place although it was small and seating was limited. 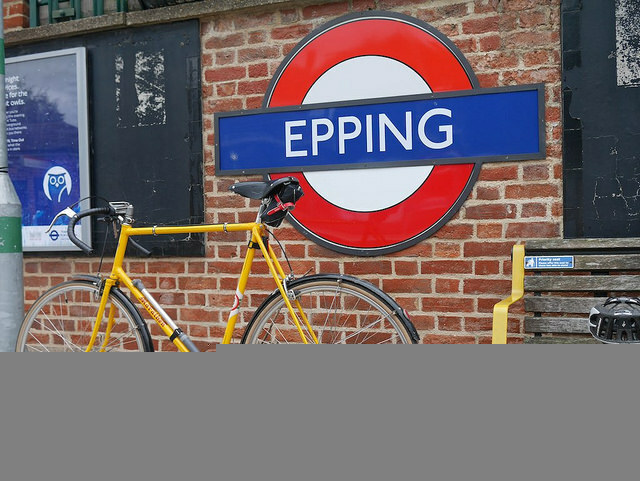 Refreshed we mounted up and rode the few miles back to Epping Station. 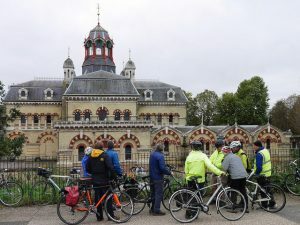 A band of 12 defied a horrid weather forecast to set off from the View Tube in their search of knowledge of some, at least of Newham’s rich heritage. 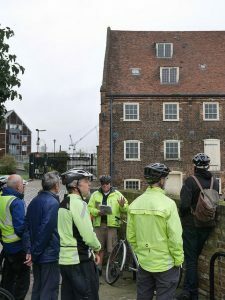 We were aided by some interesting sound clips provided by Eastside Community Heritage, some Wikipedia and other material (see earlier post), and – best of all the knowledge found within the group itself – historical, architectural, football etc. 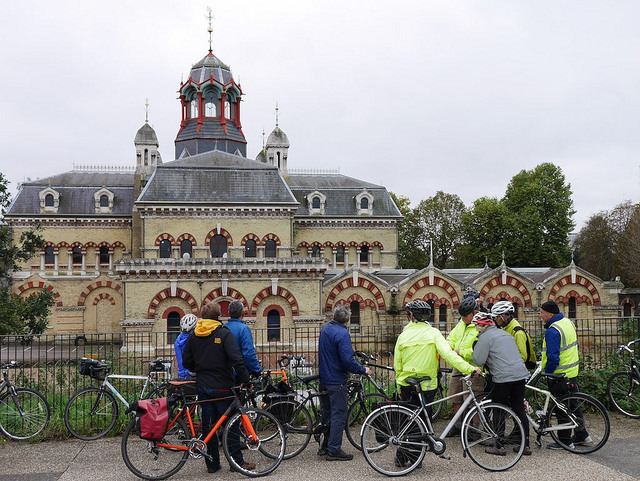 and Abbey Mills Pumping Station. Miraculously neither the umbrella, nor the rescue float, nor even the repair kit was called upon. and we picked up 3 more as we started along the Greenway. 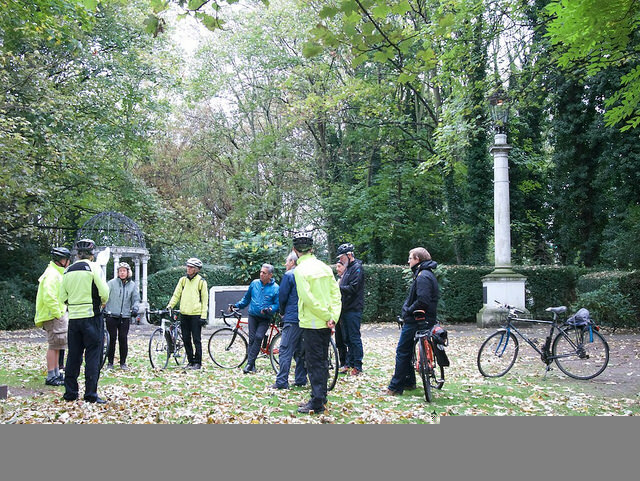 Fortunately we had two of the group’s ace photographers (Robin and Steve) to capture it the day. brought the reward of an open day at the national Trusts’ lovely Rainham Hall and a quick stop to inspect the beautiful gardens. The Thames was as atmospheric as ever. A coffee stop at the RSPB centre (which now has bike hire and other outdoor activities) and a visit to the site of a house stayed in by Dracula led us to the Ingrebourne Valley and the train back from Upminister. On my calculation 25 miles, almost all off road.